A stunning oil on canvas by a listed British artist Harry Fidler ROI RBA who worked in St Ives, Cornwall. This is an original work in excellent condition which was exhibited at the Royal Society of British Artist in 1932 and it still retains the exhibition label verso. 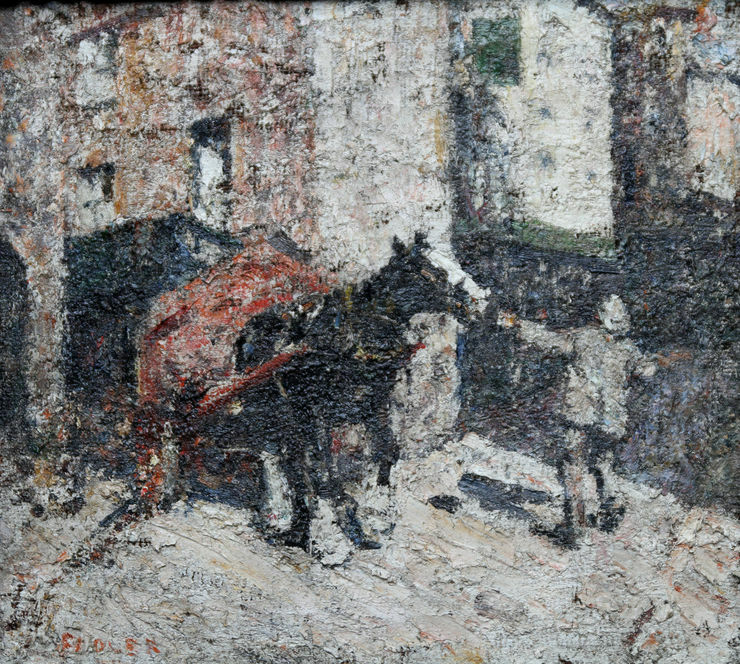 Painted in a heavy impressionistic impasto style the artist captures light and movement of the horse as it is pulled from the The Sloop Inn in St Ives in Cornwall. It is in its original frame. The Royal Society of British Artists 1932 Exhibited work. Bourlet exhibition frame. 18 inches by 16 inches. Excellent condition. 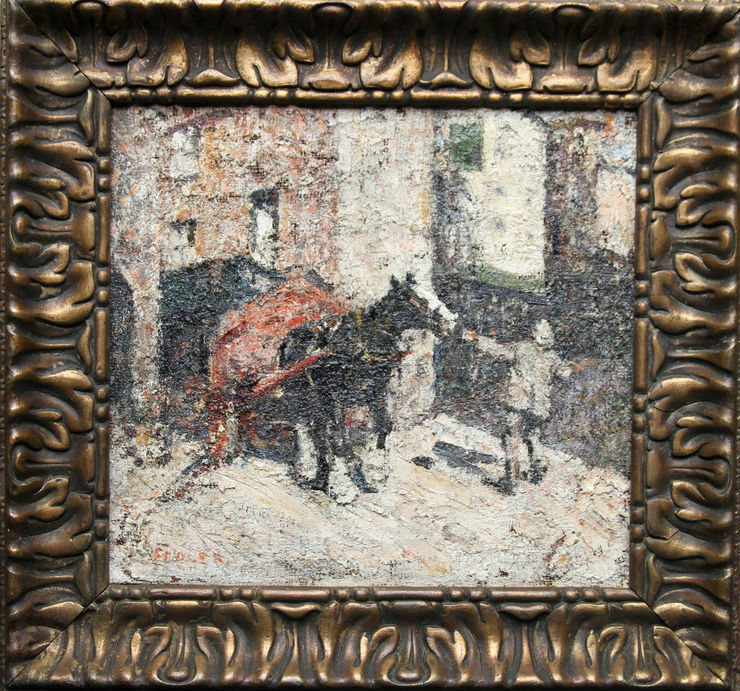 Harry Fidler (1856-1935) was a painter of genre and country scenes, often incorporating heavy horses at work on the farm. He painted in a highly distinctive style, applying his paint in a free and liberal manner. The ensuing result produced Impressionist paintings with a high level of impasto. His colouring was muted and chalky. Fidler studied at Herkomer’s School at Bushey, which later became the School of Animal painting, under the direction of the famous equestrian artist, Lucy Kemp Welch, a former pupil. Fellow pupils included Tom Mostyn, Arnsby Brown and William Nicholson. Herkomer claimed that he encouraged each student to develop their own individual talents, and this is in some part substantiated by the wide variety of artistic fields in which they ultimately excelled. His methods were nevertheless strongly rooted in working from life, in naturalism, with little reference to traditions of English painting or more modern intellectual theories. Fidler exhibited at the Royal Academy, London from 1891. He also exhibited at the New English Art Club , the Paris Salon , the Royal Society of British Artists and at the Goupil Gallery in London. In 1919 he married his fellow artist, Laura Clunas, and they made their home at the White House, Stoke, Andover, where they lived until Fidler’s death in 1935.